A Sharpie and a clean mug are all you need! I recently learned about an interesting craft idea: apparently if you draw on a ceramic coffee mug with a Sharpie marker, then bake that mug for 30 minutes at 350 degrees, the marker becomes permanent. However, it is hand wash only, and you will want to be careful with it. Some people have reported that the marker washes off if you put it through the dishwasher. Some people have apparently had the marker wash off just through hand-washing, too. 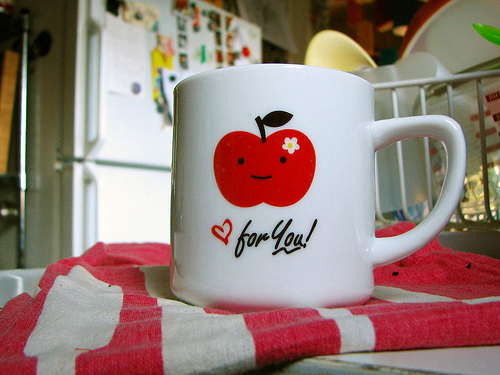 One thing I will suggest, if you want to try this, is that you wash the mug before you start drawing. I suspect that sometimes when people have trouble with the marker coming off, it is because the mug was not 100% clean before they began. The marker needs to be laid directly on the porcelain of the mug, and even invisible fingerprints can keep marker from adhering correctly. Before you begin, wash your mug thoroughly. If you hand-wash your dishes, I would recommend using a heavy-duty degreasing detergent like Dawn dishwashing liquid. If you use a dishwashing machine, I recommend pulling the mug out at the end and giving it an extra rinse in clean water, to be sure there is no residual film of soap left behind. Dry your mug completely. You might want to leave it sitting out for 12-24 hours before you begin, just to be completely sure. When you handle your clean mug, both to take it out of the wash and before you start working on it, wash your hands well. This will keep any extra grease or grime from transferring from your fingers back to your nice clean mug. Be sure your hands are completely dry before you start working on your mug, to keep it from getting damp. If you REALLY want your mug designs to stick around, get a professional grade pen. The Pebeo Porcelaine 150 China Paint marker is considered the gold standard. Once baked, it is dishwasher safe, and even resists scrubbing with steel wool! The Pebeo china paint markers come in a wide range of colors and tip sizes. Each one costs between about $8 and $10, depending on where you buy it. A Pebeo marker might sound pricey compared to a plain old Sharpie. But considering how much use you can get out of one marker, I definitely think it's worth the extra cost to ensure that your designs are truly permanent.